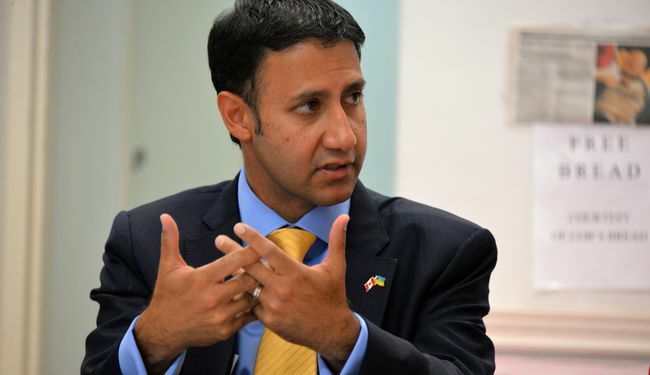 Mr. Arif Virani, member of the Canadian Parliament, Parliamentary Secretary to the Minister of Canadian Heritage (Multiculturalism), recently visited Ukraine for the first time. He had talks with the Ombudsman, Minister of Defense, and met with Crimean Tatar leaders Mustafa Jemilev and Refat Chubarov. He watched the military parade on Independence Day. Mr. Virani is known to have addressed parliament, sporting a Ukrainian vyshyvanka embroidered shirt. There is a Ukrainian flag in his Toronto office, so my first question was when he had installed it. When did you learn about Ukraine and understand what it is all about? “Over the past five years. I had good tutors, among them [Foreign Minister] Chrystia Freeland. She taught me the difference between varenyky and pyrohy, and it was very important for me (laughing). How did you succeed in integrating into the Canadian cultural environment? From what I know, you were born in Uganda and then emigrated to Canada. “That’s right. Like many Canadians, I came from somewhere else – as was the case with the first Ukrainians who came there 170 years ago. Canada continues to settle refugees. I was exiled when I was a baby and we were forced out of Uganda, and Canada opened its arms to me and my family, also to thousands of other Ugandan South Asians. My ancestry is in India. There were many Indians living in Ghana, Kenya, and Uganda when they were expelled in 1972 by the government. Some went to India, others to Pakistan, England, America. Seven thousand went to Canada. I was among them. “I think the beauty of Canada is that it’s very much a land of opportunity. Yes, I’m a brown-skin Muslim South Asian refugee, but I also went to public schools, I went to two universities and became a human rights lawyer when I got elected [to the Canadian Parliament] in 2015. That wasn’t uncommon as four refugees were elected at the same time. There were 41 members of parliament of whom not one was born in Canada. They were born all over the world. This is a great testimony to Canada. It’s a land of opportunity where you can prove what you want. Mr. Virani, I came across your discussion with Mr. Bernier on Twitter. What was it about? In your tweet marking the 75th anniversary of your mother Sul you said she wanted you to read newspaper starting from page one, not just sports columns and that you had started doing just that. Any comment? The relations between your country and Saudi Arabia have been strained of late. Did you discuss the subject here in Ukraine to ascertain our stand in the matter? What about practical cooperation between our countries? Were any new agreements discussed in Kyiv? “As Parliamentary Secretary to the Minister of Cultural Heritage, I discussed an agreement on audio-visual production that would enable television production in both countries, providing for preferential treatment for economic and tax purposes. Thus, Ukrainians working in Canada would be treated like a domestic production and Canadians in Ukraine would be treated likewise. We have more than 50 such agreements around the world. We’re pursuing one just now. I just met with [the Minister of Culture] Mr. Nyshchuk, the Ukrainian side is apparently interested. “I want to emphasize that we are proud to be here with troops on the ground and Operation UNIFIER. I think it’s the second largest number of troops in any country. There are many ways for Ukraine to develop, ways to support civil society, governance, rule of law, training. There is also just basic economic development and telling Ukrainian stories. Did you discuss the possibility of Canadian weapons supplies to Ukraine or joint arms manufacture? You met with Defense Minister Poltorak on August 23 in the evening, didn’t you? Summing up, what do you think the West, the United States, and the European Union should do to make Putin withdraw from Crimea and Donbas, as envisaged by Western sanctions which President Barack Obama initiated in 2014? Do you think that the Trump Administration will persuade Putin to change his conduct, considering the increasingly tougher sanctions against Russia, the sale of Javelin anti-tank missiles and increased military aid to Ukraine?